1 – Bake meatballs according to package directions. 2 -In a medium saucepan, combine barbecue sauce, mango cubes and chipotle seasoning; stir to blend. Simmer over low heat for 15 to 20 minutes, stirring occasionally. 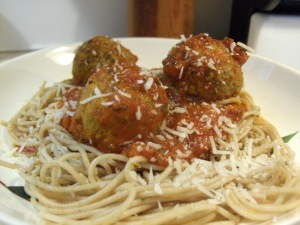 3 – Add cooked meatballs to sauce and simmer for 5 to7 minutes. Serve warm. 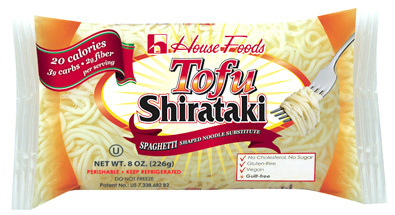 Calories 394, Carbohydrates 38g, Cholesterol 81mg, Fat 16g, Fat Calories 24, Fiber 2g, Protein 25g, Sodium 777mg. Daily Values: . Percent Daily Values are based on a 2,000 calorie diet. Another beautiful Spring Day out again. Went and got Mom’s car washed for her and stopped at the bank. Later took my Mom to Home Depot, we needed some new shades for the living room windows and picked up 5 bags of fresh mulch. For dinner tonight I prepared Turkey Meatball Mini Sub w/ Baked Fries. I reheated the Turkey Meatballs leftover from dinner a couple of nights ago. 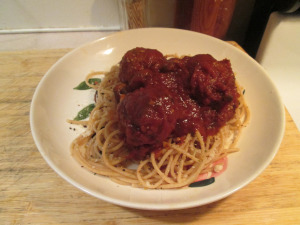 I had used Honeysuckle White Fresh Italian Style Turkey Meatballs. I’ve tried many different Turkey Meatballs and these are the best tasting I’ve found. Their 190 calories and 5 net carbs per serving (3 Meatballs ). And three is plenty as these are good size Meatballs. They were marinated in Ragu Chunky Mushroom Pasta Sauce. When Meatballs are completely heated through I served them on an Meijer Bakery Perfection Deli Mini Wheat Sub Buns and topped with Sargento Reduced fat Shredded Mozzarella Cheese. 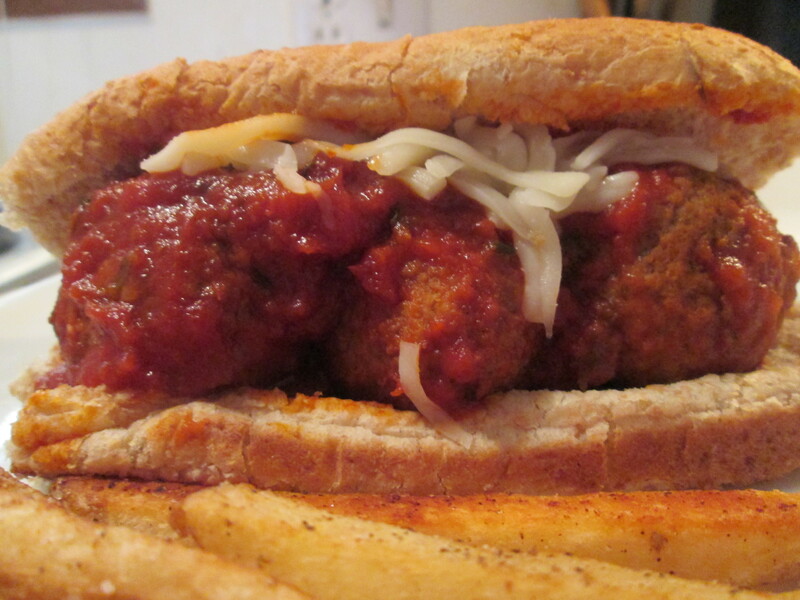 Makes one fine Turkey Meatball Hogie! I served it with a side of Ore Ida Simply Cracked Black Pepper and Sea Salt Country Style Fries, my favorite fries! Later tonight for dessert a Jello Sugar Free Black Cherry Jello. Ragú® Super Chunky Mushroom bursts with chunks of garden style mushrooms and a delicious mushroom taste. This rich, flavorful tomato sauce has the just the right amount of hearty mushrooms for mushroom lovers to enjoy. 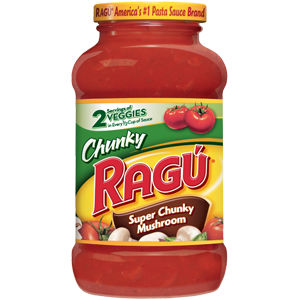 Mom knows that Ragú®’s Super Chunky Mushroom is a balanced sauce that the whole family will love. A sunny Spring day out today, but we still have a cool light breeze blowing. Took the Cart out for a spin but wasn’t out too long due to the wind. The past day or so Mom and me have been gathering old bills and documents that needed shredded. This morning around the area was Shred Day. They have this every Spring where you can drop off anything you need shredded. I believe there was 4 drop areas this year from 9-1. I went over to one that was about 2 miles away around 9:00 this morning. I had no clue what I was in store for! There was literally hundreds, and I mean hundreds, of cars already in line! So from 9:02 this morning till about 10:10 I was in line to drop off 6 bags of bills and papers that needed shredded. The line actually moved quicker than what I thought it would, but what a traffic nightmare it was over there. Next time I’ll go early. We have a shredder, but its old and very slow. Maybe it’s time to invest in a new one. Anyway for dinner a classic comfort food, Spaghetti and Turkey Meatballs with French Bread. 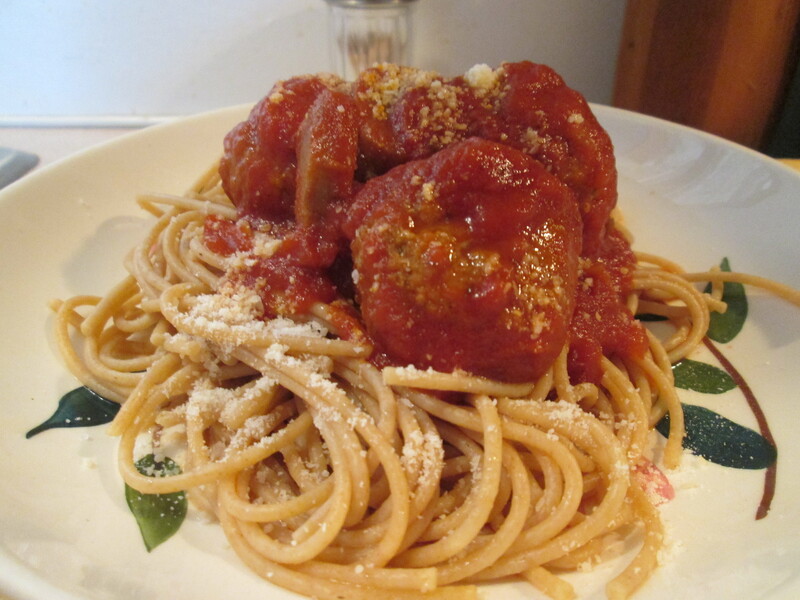 You just can’t go wrong with a Spaghetti and Turkey Meatballs Dinner! I used Ronzoni Healthy Harvest Whole Wheat Spaghetti and Turkey Meatballs along with Honeysuckle White Turkey Meatballs. I always use Ronzoni Healthy Harvest Pastas. The Spaghetti is 180 calories and 35 net carbs, which isn’t bad for Pasta. 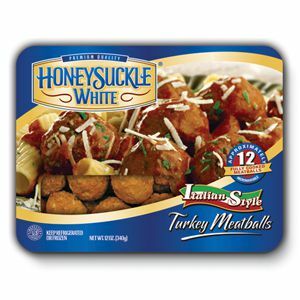 The Honeysuckle White Turkey Meatballs are the best I’ve found, fantastic taste and their 190 calories and 6 carbs for 3 Meatballs. Topped everything with some fresh grated Parmesan Cheese and Ragu Chunky Mushroom Pasta Sauce. I normally use Bella Vita Low carb Pasta Sauce but was out of it so I went with the Ragu, which was excellent! I also baked a loaf of Pillsbury Rustic French Bread. Before baking it I brushed the top with extra Virgin Olive Oil and sprinkled Sesame Seeds across the top. It was a real Italian treat tonight! For dessert later a Jello Sugar free Double Chocolate Pudding topped with Cool Whip Free. Another cloudy day but it’s in the low 50’s, not bad for December! Went to Walmart and picked up a few items that were on sale for Christmas Gifts and picked up a couple of items for tonight’s dinner. Tonight one of my favorites, Spaghetti and Meatballs. I used Ronzoni Healthy Harvest Whole Wheat Spaghetti, my favorite Pasta. Then for my Meatballs I used Honeysuckle White Turkey Meatballs. The Honeysuckle White Turkey Meatballs are the best I’ve found, fantastic taste and their 190 calories and 5 net carbs for 3 Meatballs. 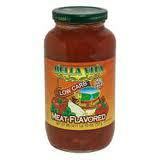 I normally use Bella Vita Low Carb Pasta Sauce but here lately I’ve been using LaRosa’s Original Pasta Sauce. I added my Meatballs and Sauce to a Sauce Pan and then added a small jar of Green Giant Sliced Mushrooms and simmered on low until all was heated. 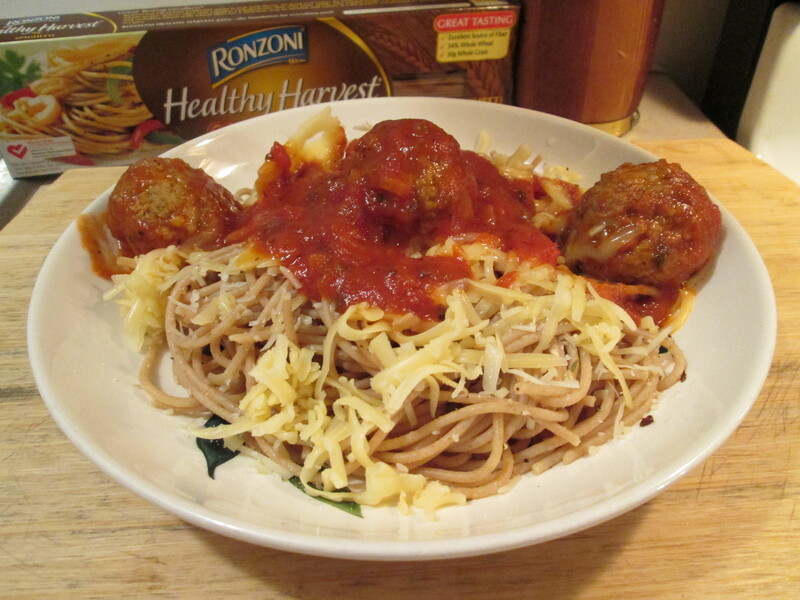 I topped the Spaghetti and Meatballs with some fresh grated Murray’s Parmigiano-Reggiano Cheese. For dessert later a Healthy Choice Chocolate Swirl Frozen Yogurt. Don’t get rid of that leftover Cranberry Sauce, instead make some Cranberry Meatballs! Meatballs are simmered in a cranberry sauce/bbq sauce combination. Make your own small meatballs or buy some Jennie – O or Honeysuckle White Turkey Meatballs. Just stick them on toothpicks, and you’ve got a festive holiday appetizer. When eating pasta, try to balance the meal with some protein to allow for balanced blood sugar levels. Maybe that’s why Grandma always made spaghetti and meatballs. Hint 2 of the Day! If you insert a small piece of cracked ice into the center of your meatballs before browning them, they will be moister. But be careful you’ll need to experiment to make sure the centers don’t remain raw. Cut open a meatball and check the doneness to determine the proper browning time. Really enjoyed the day, out spreading Christmas Cheer! I was out delivering Christmas cards and Gifts this afternoon. I love giving friends and family gifts, It’s my favorite part of Christmas! I dropped off Candy and Gift Cards to my Family Doctor and his staff and cards and candy to my long time Oncologist along with his staff. Also while at my Oncologist, as I always do every month, I dropped off a huge box of Snacks – Doritos, Lay’s Potato Chips, Cheese Crackers, and such the treatment center in his office. It’s so sad, they enlarged their in office treatment center for cancer patients and it’s still not large enough to treat all the patients fighting cancer. I received treatment there myself once and I hold a very soft spot in my heart for all those fighting the various forms of cancer. So I make sure I drop off snacks for the patients to snack on while receiving their treatments. I finished up my gift deliveries by dropping a few cards off to my neighbors. I’ve got some great neighbors, they are always there to help and assist me with what ever help I need. Being in a wheelchair having good neighbors like I do is a blessing! Well for dinner I prepared Mushroom & Smoked Cheddar Bison Burgers w/ Crinkle Fries. yes I’ve got my Mom eating a Bison Burger, she’s coming around! I used Great Range Ground Bison Sirloin. I seasoned it with McCormick Grinder Steakhouse Seasoning and pan fried them about 3 – 4 minutes per side, 3 minutes for mine I like medium rare. I served them on a Healthy Life Whole Grain Bun and topped them with Sauteed Baby Bella Mushrooms and a slice of Borden Smoked Cheddar Cheese. For a side I baked some Alexia Crinkle Fries with a dipping side of Hunt’s Ketchup. For a dessert/snack later I prepared some BBQ Pineapple Turkey Meatballs. 3 ingredients; 1 package Honeysuckle White Turkey Meatballs, 1 bottle BBQ Sauce (I used Montgomery Inn Sauce), and 1 small can Dole Pineapple Tid Bits. Just add all ingredients to a medium size sauce pan set it on low and let it simmer till warmed through out. Makes a great little quick snack or appetizer. It was SpaghettiI and Meatballs tonight ! used Ronzoni Healthy Harvest Whole Wheat Spaghetti along with Honeysuckle White Turkey Meatballs. Topped everything with Kraft Shredded Parmesan Cheese and Bella Vita Low Carb Pasta Sauce (Meat Flavored). Along with the great taste the Sauce is only 70 Calories and 6 Carbs! At the end of the post I left the product description for the Ronzoni Spaghetti and the Bella Vita Pasta Sauce. I also had healthy Life Whole Grain Bread that I buttered with I Can’t Believe It’s Not Butter and then sprinkled with Shredded Parm Cheese. Then I baked it at 350 degrees for 7 minutes. Makes an quick and easy way for a side of Bread for Pasta Dishes. For dessert/snack a 100 Calorie Mini Bag of Jolly Time Pop Corn.